I did this walk on Sunday 22nd August 2010 with Sara and Derek. 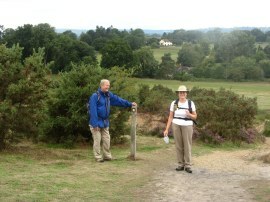 As usual we met up at the end point of the walk and then took one of the cars back over to the start at Reigate Heath. We had planned to meet at 9:30 but we all had good journeys and were at Holmbury St Mary just after 9:00. The weather forecast had been for heavy rain, and it was raining heavily in Walthamstow when I set off however this rain soon cleared and we spent almost all the walk in the dry with only a couple of light showers throughout the day. The air however was very still and close and incredibly humid and I spent the entire day feeling very hot and sticky, not helped as I was wearing my slightly thicker waterproof trousers. 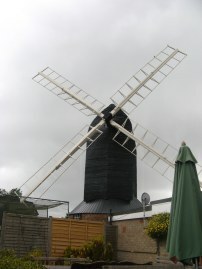 From our parking spot is was just over a quarter of a mile walk across Reigate Heath to reach the point we had finished the last stage of the walk, close to the Windmill Church, photo 1. As we were looking around the windmill it started raining so we stopped to put on our waterproofs only for the rain to immediately stop again. 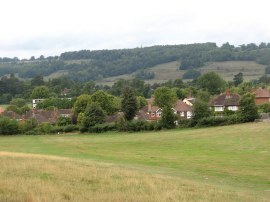 From the windmill, and golf club house, the Greensand Way heads gently downhill across one of the fairways of the golf course to join a track by an isolated house that heads between fields. Reaching a small patch of woodland the route turns to the left along a track with a large pond on the right although this remained obscured from view. This track heads through Dungates Farm, where there were a number of barking dogs, although the sort that were too lazy to actually stand up and come over, fortunately all bark but no bite. The path then follows Dungates Lane for a short distance before joining a footpath on the left that heads alongside a field edge path to reach another track, which the route crosses to enter a field which had been sub divided into a number of smaller paddocks by an array of electric fences. 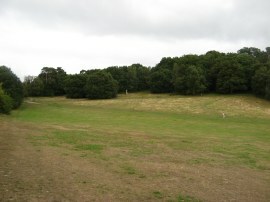 The route heads a short distance across this field to join yet another track, heading to the right. 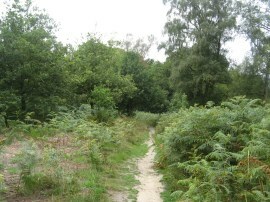 This track is followed down to Old Lane where the route turns left and immediately left again along Sandy Lane. Reaching the end of Sandy Lane the route heads to the right along a field edge path that runs parallel with Wonham Lane. At the end of the field the path joins the road, opposite the River Mole, photo 3. 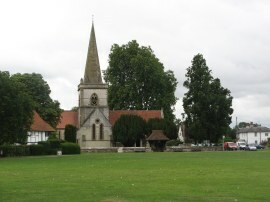 Wonham Lane is followed down to its junction with The Street in Betchworth, the route continuing ahead through a stone archway into the grounds of the Church of St Michael, photo 4, which apparently was one of the locations for one of the weddings in four weddings and a funeral. Leaving the churchyard the Greensand Way soon joins a footpath that ran along the edge of a large cornfield. In the field to the left was a large herd of cows all huddled together besides the path, when looking at the route on Multimap there was also a herd of cows in exactly the same spot. To our right the North Downs were only a short distance away, photo 5. Leaving the fields we continued along a footpath that ran behind houses before bending round to the left to cross a footbridge over the River Mole. 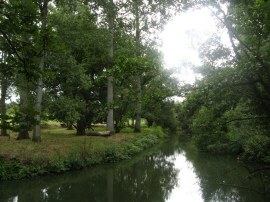 The path then heads round Brockham Court farm to reach Brockham Green. 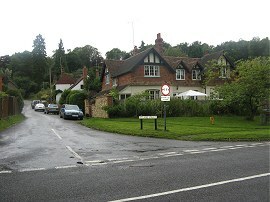 The route turns to the right, heading alongside the green passing two pubs on the right and with views across the green to Brockham Church, photo 6, on the left. 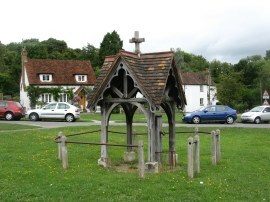 Brockham was a very attractive village with many nice houses and cottages around the green. Crossing the main road the route passes an old water pump, photo 7, before continuing ahead along Old School Lane. Here the route crosses Tanners Brook where a metal sign from 1904 warned against "the sticking of bills or committing any other nuisance". Just after the brook the route bears to the right along a track known as the Coach Road before turning to the left along a footpath that heads between fields to Pondtail Farm where the Greensand Way joins another footpath on the right. 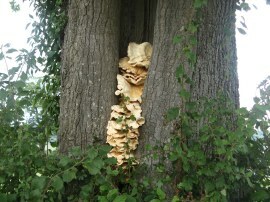 We spotted a large number of different fungi during the day including the one in photo 8 growing in a gap in a tree trunk. 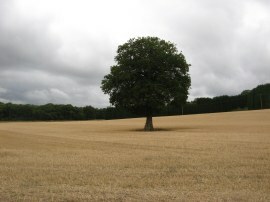 The route continues ahead, passing under some railway lines before joining a track that curves uphill past a large field with one solitary tree in the middle, photo 9. Heading up this track the route passes another fine house on the hillside with excellent views across the surrounding countryside to join a driveway that runs up to Punchbowl Lane which is on the outskirts of Dorking. Just before we reached the road we stopped for a short break before continuing to the right along Punchbowl Lane then turning left into a road, Deepdene Wood. 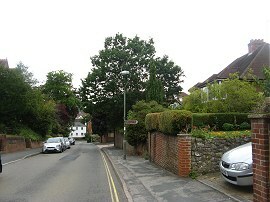 This road is followed round to the left before the route joins the first turning on the left, heading steadily uphill amongst a number of big houses. Close to the top of the hill the route passes an extremely tall Monkey Puzzle Tree and I picked up a few seeds that were lying in the road to see if I can grow them. Passing the last house at the top of the hill the route heads to the right along a path that runs between trees over the top of a hill, photo 10. Just past a circular metal bench at the top of the hill the route starts heading downhill to the right to cross the A24. Once over the road the route heads alongside a field to enter Glory Wood. Entering the woodland there is a choice of route signposted, a shorter route that heads directly across the wood, or a slightly longer route that heads round three sides of the wood and is the route as marked on the Ordnance Survey map. A toss of a coin saw us follow the longer route that headed downhill towards some houses before turning to the right to run behind gardens before turning to the right again to head uphill to eventually meet up with the other path at the edge of the woods. Leaving the woods we headed downhill alongside a grassy area and past some allotments to join a track which ran past a school to reach St Paul's Road West. Here we turned to our left, following the road past St Pauls Church. Approaching the end of St Paul's Road West, photo 11, the route joins a footpath on the right that is followed between houses for a short distance before turning to the left along a similar footpath. This leads down to South Street where the route continues ahead to cross over Vincent Lane before heading to the right past one house before joining another footpath that heads steeply uphill to reach another suburban street. At the end of this street the route heads to the left along Nower Road. At the end of Nower Road the route turns briefly to the right before heading uphill to the left over a patch of open ground towards some trees, photo 12 known as the Nower. Reaching the tree line the route turns to the right however first we stopped at one of the many benches that line the path for our lunch break. Opposite us in the distance was the North Downs and we could make out the spire of the church at Ranmore Common rising above the trees as well as the route of the North Downs Way as it starts descending downhill through Denbies vineyard, photo 13. From our lunch spot the route headed along a path that meandered through the trees, photo 14, to reach a small unnamed road. 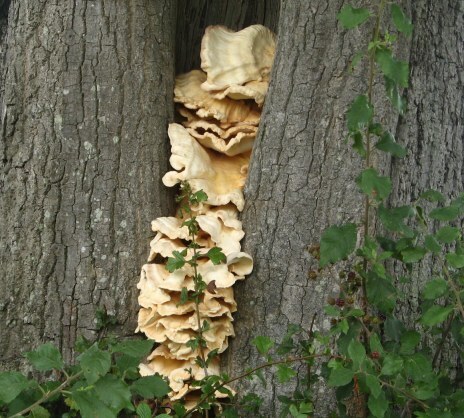 We had gone slightly off course through the woodland but still reached the road at the same spot as the Greensand Way, a number of paths all heading in roughly the same direction. The road is followed to the left before the route joins a track on the right which heads down to Milton Street. Here the route heads to the left for a short distance before joining a footpath on the right that heads besides another very attractive cottage. This path soon leads to a hedge lines track that runs rather gloomily for some distance behind the houses of Westcott. It had started raining at this point although the trees that lined the path provided quite good cover. 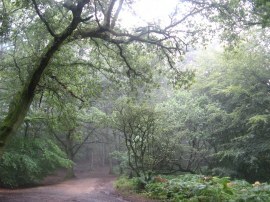 Eventually the route heads up alongside an area of trees to reach Longmore Lane . To the left of the path was an isolated graveyard, the church hidden in the trees on the other side of the lane. Crossing the lane the route heads by a small pond along a track that heads over Westcott Heath. 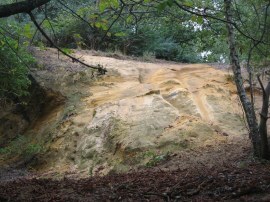 The route crosses a road and then heads down through the trees to reach the A25, close to an old sandstone quarry, photo 15. No sooner does the route reach the A25 it heads to the left up Rookery Drive, following the lane as it heads passed a house with a small waterfall besides it before turning to the left to run below a much less attractive new development of houses. The path now begins climbing gently uphill, heading above a couple of large ponds. Leaving this track the route joins a footpath on the right that heads up more steeply through a patch of woodland, photo 16, to join a byway, Wolvens Lane. The byway was quite narrow and there was a footpath besides it but this soon grew too overgrown to walk along and thus we ended up heading along the byway for the short distance down to Sheephouse Lane. Here the route turns to the left to join another farm track, running to the right of a large field that had been planted with maize. At the start of the track was a house where a very tempting BBQ was taking place in the back garden which overlooked the path, creating the sort of smell that instantly makes one feel hungry. To the right of the track was Tilling Brook which gradually grew closer as we headed along the long track, photo 17, slowing climbing uphill. 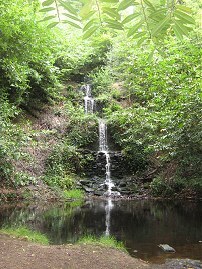 After a while the route passes some woodland where there was a waterfall falling down from the hills on the left, photo 18. Crossing Tiling Brook the track heads up to join a road at a place named Broadmoor, some one and quarter miles from Sheephouse Lane. 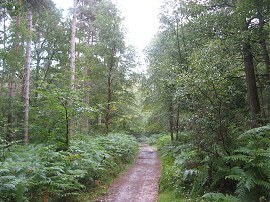 Here the route turns to the left to join Whiteberry Road, a track that runs through another stretch of woodland. 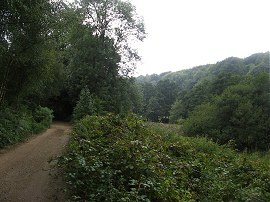 After about half a mile the track ends and the route continues ahead along a footpath that heads uphill through the trees, photo 19. A much heavier shower had passed over the woodland and the ground was quite damp as were the trees which occasionally dropped large drops of water on us. 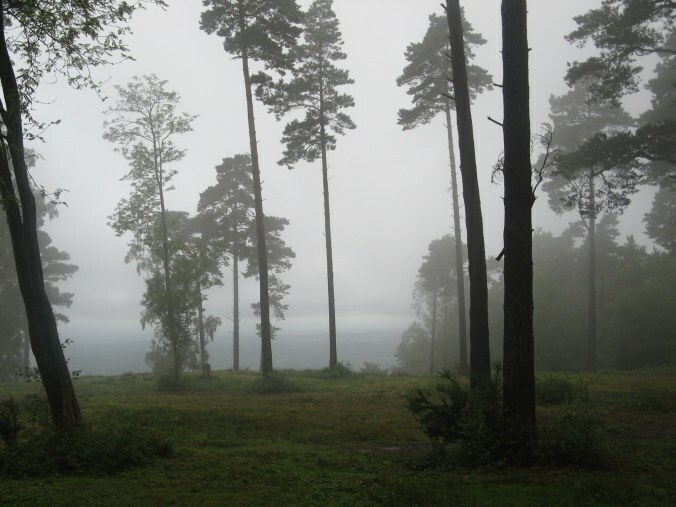 The air was still very still and humid as we headed up through the damp woodland towards the top of Leith Hill and I have to say I was covered in sweat. The path starts climbing more steeply as we neared the summit we stopped for a short break to fortify ourselves for the final push to the top, I had been feeling hungry ever since I smelt the BBQ earlier! Approaching the summit of the hill, photo 21, the route turns to the right for one final short climb up, the trees now shrouded in cloudy mist. 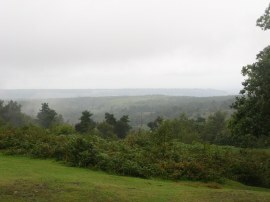 Leith Hill is the highest point in Surrey at 294 metres, and the highest point on the Greensand Ridge. 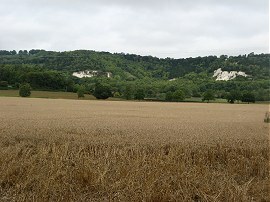 Due to weather the views were rather limited although they were slightly clearer towards the North Downs, photo 22. 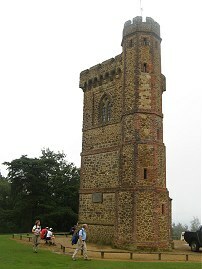 Leith Hill Tower, photo 23, was built in 1765 and was fully restored by the National Trust in 1984. 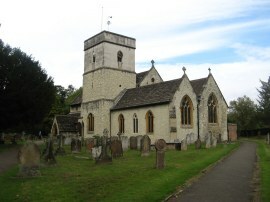 It is possible to climb to the top of the tower and there is also a small shop at the bottom serving teas and snacks. Looking towards the South the weather was rather mistier and the view quite limited, photo 24, though the misty trees did have a certain charm..
From Leith Hill the only way is down and the route descends from the top of the hill along a track that heads to the West towards Leith Hill Road. We went slightly off course, following the signed footpath that leads down to a car park on Leith Hill Road however after heading a few yards to the left along the road we were back on course. Crossing the road the Greensand Way joins a track that continues ahead before joining a track on the right. 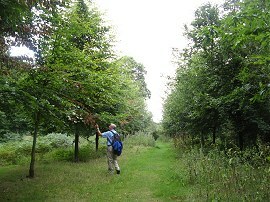 The route heads through the trees before turning to the left to join another track on the left which heads up to High Ashes Farm. Passing the farm the route enters another large area of woodland, steadily descending for most of its length as the Greensand Way makes its way down to Pasture Wood Road. 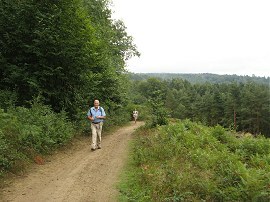 The track gradually narrows to become more of a footpath, at one point passing through an area where the trees had been harvested which opened up the views a bit more, photo 25. Reaching the road it was then only a short walk to the left, passing a very smelly dead badger on the way, to reach Horsham Road where we ended this stage of the walk along the Greensand Way at the junction with Pitland Road, photo 26. Reaching the car we had walked 15.6 miles, 15.2 of which had been along the Greensand Way. This had been another pleasant walk through the Surrey countryside and given the earlier forecasts we had been very lucky with the weather. For much of the day my right shin had been very sore, I think because of my long car journey back from Cornwall the day before however after a nights rest it felt better again. 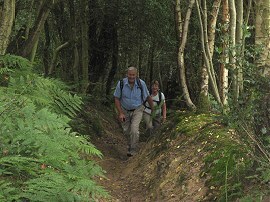 There are now just two stages of the route left to walk and then it will be time to think of our next walk. 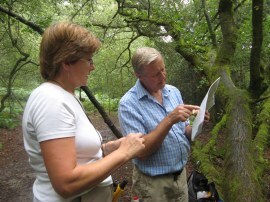 As usual I have uploaded the route of the walk which can be accessed here: Greensand Way 6 Route.